Week 89 took over where week 88 left off, halfway through managing hubby’s leg burn and various trips to hospital for leg dressings and caring for him at home. I used Mary Berry’s Baking Bible as a bit of respite and my challenge as an excuse to do something normal for an hour or two. I chose Mary’s almond and cherry tray bake and the Florentine biscuits. I had caught up on the Great British Bake Off and saw that they contestants would be making Florentine biscuits so thought I would give them a go as they were in the bible and I hadn’t done them yet. I started with the tray bake which is the usual Mary’s easy recipe of throw all the ingredients in a bowl and mix and pour! I put the tray bake in the oven and sat and read the Florentine recipe carefully. The tray bake baked well and smelt amazing. I left it to cool while getting on with the biscuits. Mary’s Florentine recipe asks you to put the sugar, butter and golden syrup into a pan and heat gently, allowing it all to melt. Allow to cool slightly and add the rest of the ingredients and stir well. Add spoonfuls of the mix to the baking trays and bake. Watch the biscuits carefully as they can go from under baked and a bit soft to burnt very quickly- this didn’t happen to me thankfully but Mary adds this warning to her recipe! Once bakes, allow to cool slightly and transfer to a baking tray. Then melt some dark chocolate and spread over the back and make a zig zag pattern with a fork in the chocolate. 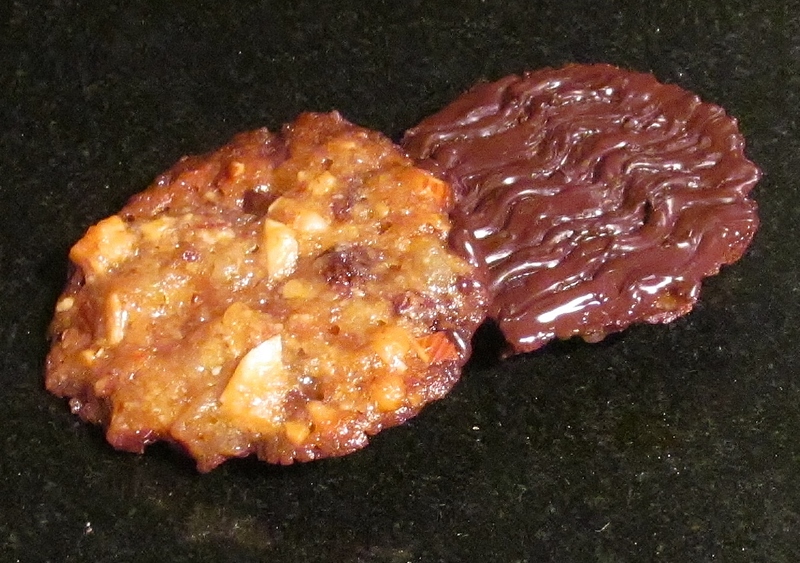 I watched the Great British Bake Off this week and thought that they all did a cracking job with the technical challenge of Florentines and was pleased that mine had gone well- the only downside was that hubby and I didn’t like them very much! This entry was posted in Kim's cake challenge and tagged almonds, Baking Bible, cherries, cherry & almond tray bake, florentines, Great British Bake-Off, Kim's Cake Challenge, Kim's cherry & almond tray bake, Kim's Florentines, Mary Berry, Mary Berry's Baking Bible, Mary Berry's cherry & almond tray bake, Mary Berry's Florentines by kimsideas. Bookmark the permalink. The Florentines would have won the Great British Bake Off. 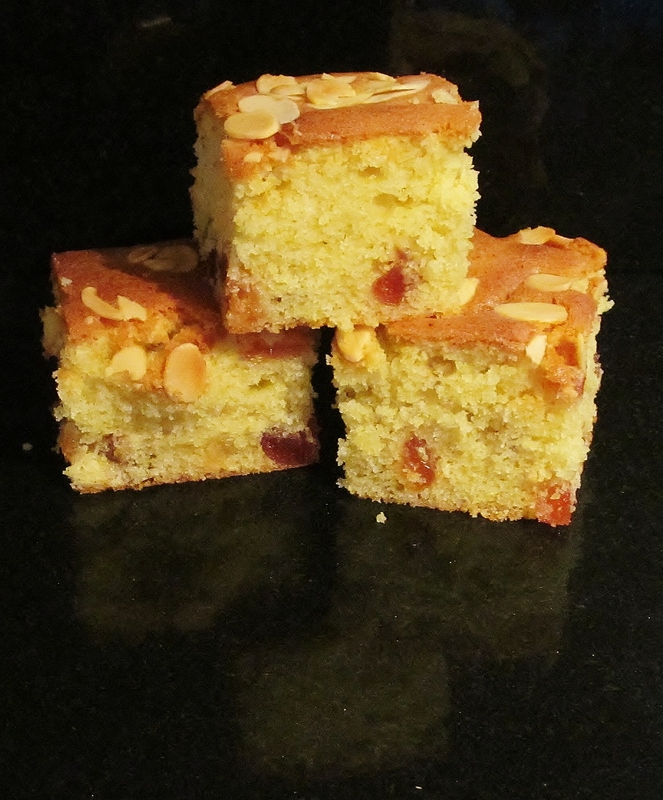 They were fantastic and the Almond and Cherry Tray Bake was excellent. More please! !